in response the continuously increasing number of flights and travellers. In fact, a lot of work is going on at the airport. Málaga Airport is the main international airport of Andalucia accounting for 85 percent of its international traffic and is the only one offering a wide variety of international destinations. The airport, connected to the Costa Del Sol, has a daily link with twenty cities in Spain and over one hundred cities in Europe. Direct flights also operate to Africa, the Middle East and North America. In 2009 Málaga was the 33rd busiest airport in Europe. Access to the airport from Malaga city is made by the A7 road towards Algeciras. Take exit 235 towards Torremolinos to connect with the MA-21 and access the airport. 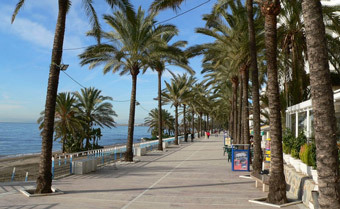 There is a half hour train service to Malaga City and Fuengirola from the station just in front of the main terminal. There is a half hour Airport Bus from outside the Terminal Two arrivals hall to Malaga city centre. There is a 45 minute Airport Coach Service (90 minute in Winter) from outside the Terminal Two arrivals hall non stop to Marbella Bus Station. Paseo del Parque (Plaza del General Torrijos)-Alameda Principal-Avenida Andalucía-Héroe de Sostoa --Héroe de Sostoa (María Zambrano railway station)-, Avenida de Velázquez (level with Puerta Blanca)-Airport. Stops: Terminal 3, arrivals forecourt road, opposite the transportation hub. Paseo del Parque (Plaza del General Torrijos)-Paseo del Parque (Town Hall)-Paseo del Parque (Plaza de la Marina)-Alameda Principal-Avda. Andalucía (post office)-Callejones del Perchel (market)-Bus Station-Héroe de Sosota (6 stops)- Avda.Velázquez (9 stops)- Avda. Comandante García Morato (roundabout)-T2 departures- Avda. Comandante García Morato-Cargo Terminal. Cargo Terminal- T1 (arrivals)-Airport (administrative services)- Avda. Comandante García Morato (Flying Club)-Avda. Comandante García Morato (San Miguel)-San Julián (airport crossroads)- Avda. Velázquez (10 stops)-Avda. de la Paloma-la Hoz-Ayala-Explanada of the station (railway station)-Bus Station-Callejones del Perchel (market)-Avda. Andalucía-Alameda principal-Paseo del Parque (Plaza de la Marina)-Paseo del Parque (Town Hall). Stops: Opposite the cargo terminal. Itinerary: Marbella Bus Station (Avenida del Trapiche s/n)-Airport. There are always plenty of Taxi's waiting for passengers at Malaga Airport. Rate 1* (weekdays from 06:00 to 22:00): per kilometre €0.84; waiting time per hour €18.47; minimum service starting at the airport €15.21. Rate 2* (weekdays from 22:00 to 06:00, Saturdays and holidays): per kilometre €1.03; waiting time per hour €23.09; minimum service starting at the airport €19.01. Supplement* to/from airport: €5.50; night-time (0:00 to 6:00), €2; origin/destination Levante port, €1; packages or suitcases larger than 60 cm, €0.45. During the August Festival and Holy Week, rate 2 will be applied. 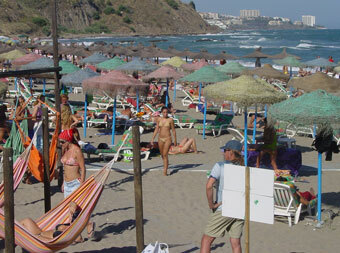 Find your hotel in Malaga now! From Malaga airport you are close to numerous popular holiday destinations in the region of Andalusia, the south of Spain. Closest is the cute and popular town of Ronda (109 km) in the mountains to the west of Malaga city. Somewhat further away you find Granada (142 km) and a bit further still the cities of Cordoba (168 km) and Seville (217 km). Traveling from Málaga by car takes you through the beautiful landscapes of the "Serranía de Ronda" to the west or the "Montes de Malaga" to the north that make the journey unforgettable.